The girls and I were getting the house ready for spring this year and my oldest really wanted to help me cook a special treat for the family. 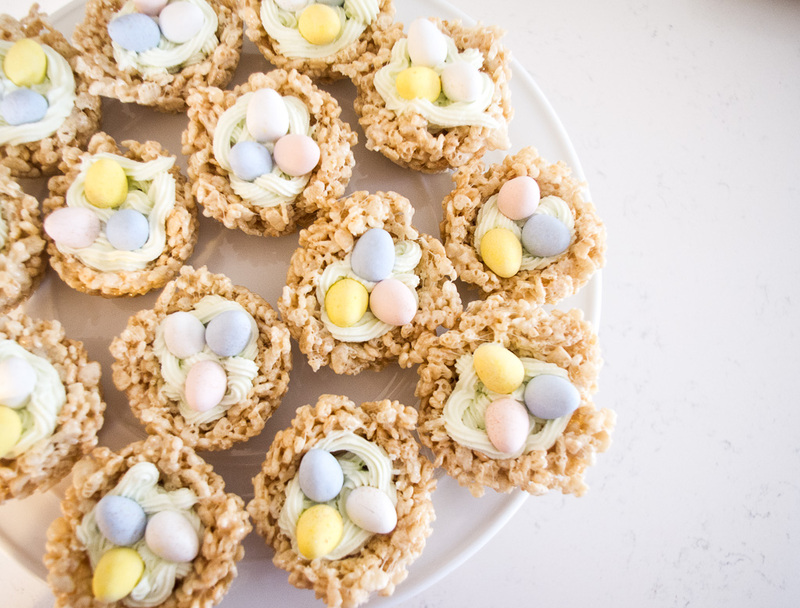 I told her we had ingredients for Rice Krispie Treats and remembered seeing on Pinterest somewhere about these little nests with Cadbury Eggs which we also had on hand, so off we went making these delicious little nests. We all had a lot of fun helping with the icing, ie. licking the spoons and whisk and counting out the eggs for each nest. I love getting them involved in the kitchen and teaching them how to bake. These Rice Krispie treat nests are so easy to make and the result is an amazing treat that kids and adults will love. It takes 30 minutes which is great when you’re in a pinch and need to throw something together quickly. In a large saucepan melt butter over low heat. Add marshmallows and stir until completely melted. Remove the pot from heat. Add Rice Krispies cereal and stir until well coated and fully incorporated. Scoop 1/4-1/3 cup of mix into muffins tins coated with cooking spray. Allow them to cool completely. While the Rice Krispies cool, make the icing. Add room temperature butter to a stand mixer fitted with the whisk attachment or use an electric hand mixer, and beat on high for 5 minutes until it is light and airy, and has doubled in size. Add the icing sugar 1/2 cup at a time, mixing on medium high for 1 minute between additions and scraping down the bowl as needed. At this point, you can add flavorings and food coloring, after all the icing sugar has been added. Use the milk to thin the mixture to the consistency that you need. Scoop icing into a piping bag with a #18 wilton icing tip and pipe icing onto the Rice Krispie nests. Place 3-4 Cadbury Eggs in each nest. The icing can last in the fridge for a few weeks. When you are ready to use it allow it to come completely to room temperature. Spray the bowl and utensil with cooking spray to make stirring easier. Soak the bowl in hot water immediately after finished to make clean-up super quick.